A note from the editors: We want to thank the Microsoft Edge team for sharing transcripts of the interviews they conducted with many of the brilliant people who have contributed to the development of CSS Grid. Those transcripts proved invaluable in compiling this history. You can watch the short video they produced from those interviews, Creating CSS Grid, on Channel 9. On October 17th, Microsoft’s Edge browser shipped its implementation of CSS Grid. This is a milestone for a number of reasons. First, it means that all major browsers now support this incredible layout tool. Second, it means that all major browsers rolled out their implementations in a single year(! ), a terrific example of standards success and cross-browser collaboration. But third, and perhaps most interestingly, it closes the loop on a process that has been more than 20 years in the making. While the modern concept of a “grid layout” has been with us since the Industrial Revolution, grids have been a design tool for centuries. As such, it shouldn’t come as a shock that grid-based layouts have been a goal of CSS since the beginning. According to Dr. Bert Bos, who co-created CSS with Håkon Wium Lie, grid-based layouts have actually been on his mind for quite some time. Looking at what books and magazines were doing with layout was a great inspiration for them. Early on, browser makers wrote off the idea as “too complex” to implement, but grid layout concepts kept cropping up. In 1996, Bos, Lie, and Dave Raggett came up with a “frame-based” layout model. Then, in 2005, Bos released the Advanced Layout Module, which later turned into the Template Layout Module. Despite enthusiasm for these concepts from the web design community, none of them ever shipped in a browser. With grid concepts being thrown at the wall of the CSS Working Group with some regularity, folks were hopeful one of them would stick eventually. And the idea that did was a proposal from a couple of folks at Microsoft who had been looking for a more robust layout tool for one of their web-based products. Phil Cupp had been put in charge of the UI team tasked with reimagining Microsoft Intune, a computer management utility. Cupp was a big fan of Silverlight, a browser plug-in that sported robust layout tools from Windows Presentation Foundation, and initially had planned to go that route for building the new Intune. As it happened, however, Microsoft was in the planning stages of Windows 8 and were going to enable building apps with web technologies. Upon learning this, Cupp wanted to follow suit with Intune, but he quickly realized that the web was in desperate need of better layout options. He joined a new team so he could focus on bringing some of the rich layout options that existed in Silverlight—like grid layout—to the web. Interestingly, folks on this new team were already noticing the need. At the time, many app developers were focusing on iPhones and iPads, which only required designers to consider two different fixed canvas sizes (four, if you consider portrait and landscape). Windows had to support a ton of different screen sizes, screen resolutions, and form factors. Oh, and resizable windows. In short, Microsoft needed a robust and flexible layout tool for the web desperately if the web was going to be an option for native app development on Windows. After working extensively with various teams within Microsoft to assemble a draft specification, Cupp and his team shipped a grid layout implementation behind the -ms- vendor prefix in Internet Explorer 10 in 2011. They followed that up with a draft Grid Layout spec, which they presented to the W3C in 2012. Of course, this was not the first—or even the third—time the W3C had received a grid layout spec to consider. What was different this time, however, was that they also had an actual implementation to evaluate and critique. Also, we, as developers, finally had something we could noodle around with. Grid layout was no longer just a theoretical possibility. A handful of forward-thinking web designers and developers—Rachel Andrew, an Invited Expert to the W3C, chiefly among them—began to tinker. The draft spec that Cupp presented to the W3C, and that his team shipped in IE10, is not the Grid Layout spec we have today. It was a step in the right direction, but it was far from perfect. It was also a compelling option because, unlike previous proposals, which specified rigid layouts, this proposal was for a responsive grid system. However, the draft spec wasn’t as approachable as many on the CSS Working Group wanted it to be. So the group looked to bring in ideas from some of its earlier explorations. Peter Linss, then Co-Chair of the CSS Working Group, also suggested that they incorporate the concept of grid lines in the spec (instead of only talking about tracks). He believed including this familiar graphic design concept would make the spec more accessible to designers. So the CSS Working Group began tweaking Microsoft’s proposal to incorporate these ideas. The final result allows you to think about Grid systems in terms of tracks or lines or templates or even all three at once. Of course, getting there wasn’t easy. As you can probably imagine, reconciling three different ideas—Microsoft’s proposal, Bos’ Advanced Layout, and Linss’ addition of grid lines—wasn’t a simple cut and paste; there were a lot of tricky aspects and edge cases that needed to be worked out. “I think some of the tricky things at the beginning [were] taking all the different aspects of … the three proposals that we were trying to combine and coming up with a system that was coherent enough to gracefully accept all of that input,” Etemad said. Some ideas just weren’t feasible for phase one of a CSS grid. Bos’ concept, for instance, allowed for any arbitrary descendent of the grid to lay out as though it were a child element of the grid. That is a feature often referred to as “subgrid” and it didn’t make the cut for CSS Grid Layout 1.0. Similarly, there were two options for handling content mapped to grid lines. On the one hand, you could let the grid itself have fixed-dimension tracks and adjust which ending grid line the overflowing content mapped to, based on how much it overflowed. Alternately, you could let the track grow to contain the content so it ended at the predefined grid line. Having both was not an option as it could create a circular dependency, so the group decided to put the grid-snapping idea on hold. and Performant: If the algorithm wasn’t fast enough to elegantly handle real-world situations like browser resize events and dynamic content loading, they knew it would create a frustrating experience for end users. Before a Candidate Recommendation (aka, a final draft) can become a Proposed Recommendation (what we colloquially refer to as a “standard”), the W3C needs to see at least two independent, interoperable implementations. Microsoft had implemented their draft proposal, but the spec had changed a lot since then. On top of that, they wanted to see other browsers take up the torch before they committed more engineering effort to update it. Why? Well, they were a little gun-shy after what happened with another promising layout proposal: CSS Regions. CSS Regions offered a way to flow content through a series of predefined “regions” on a page, enabling really complex layouts. Microsoft released an implementation of CSS Regions early on, behind a prefix in IE 10. A patch landed support for Regions in WebKit as well. Safari shipped it, as did Chrome (which was still running WebKit under the hood at the time). But then Google backed it out of Chrome. Firefox opposed the spec and never implemented it. So the idea is currently in limbo. Even Safari will drop its experimental support for CSS Regions in its next release. Suffice it to say, Microsoft wanted to be sure Grid wouldn’t suffer the same fate as Regions before committing more engineering resources to it. In an interesting turn of events, the media company Bloomberg hired Igalia, an open source consultancy, to implement CSS Grid for both Blink and WebKit. “[Igalia’s work] helped tremendously because then developers [could] see it as possibly something that they can actually use when developing their sites,” Whitworth added. But even with two ready-made implementations, some folks were still concerned the feature wouldn’t find its footing. After all, just because a rendering engine is open source doesn’t mean its stewards accept every patch. And even if they do, as happened with CSS Regions, there’s no guarantee the feature will stick around. Thankfully, a good number of designers and developers were starting to get excited about Grid and began to put pressure on browser vendors to implement it. Grid facilitates both traditional and (as shown here) non-traditional layouts. 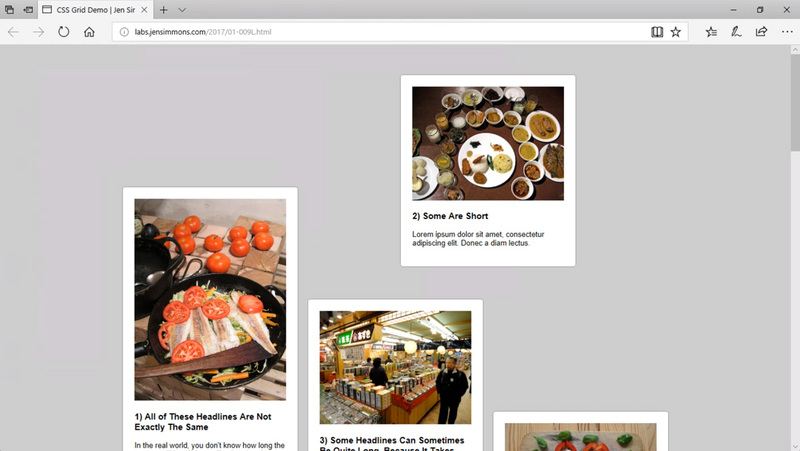 This is a Grid Layout example from Jen Simmons’ Labs, as seen in Edge 16. If you’d like to see it working in Edge but don’t run Windows, you can also view it in BrowserStack (account required). With thought leaders like Andrews and Simmons actively demonstrating the power and versatility of CSS Grid, the web design community grew more excited. They began to experiment on sites like CodePen, sharing their ideas and developing their Grid layout skills. We don’t often think about it, but developer enthusiasm has the power to bolster or bury a spec. “We can write a spec, we can go implement things, but if there isn’t developer demand or usage of the features, it doesn’t really matter how much we do with that,” Whitworth said. Unfortunately, with ambitious specs like Grid, the implementation cost can often deter a browser vendor from making the commitment. Without a browser implementation enabling developers to tinker and experiment, it’s hard to build enthusiasm. Without developer enthusiasm, browser vendors are reluctant to spend the money to see if the idea gains traction. I’m sure you can see the problem here. In fact, this is partly what has doomed Regions—performance on mobile chipsets was another cited reason—at least for now. Thankfully, Bloomberg willingly played the role of benefactor and got the ball rolling for this new incarnation of CSS Grid. So, with its help, Google landed an implementation of CSS Grid in Chromium 56 for Android in January of 2017. It landed its Chrome implementation in early March, just two days after Mozilla shipped its own implementation in Firefox. Before the month was over, Opera and Safari had also shipped support for CSS Grid. Ironically, the last company to ship CSS Grid was Microsoft. But it released its implementation in Edge earlier this week. With Grid support no longer in question, we can (and should) begin to make use of this amazing tool. One of the challenges for many of us old timers who have been working with CSS for the better part of two decades, is that CSS Grid requires a whole new way of thinking about layout. CSS Grid offers a lot of power that many of us are only just starting to come to grips with. It will be interesting to see where we go from here. This wasn’t subgrid: this was a different (interesting, but imho less critical) feature. Subgrid was part of the initial CSS Grid Layout 1.0 Candidate Recommendation. It was removed from the spec this year because it didn’t make it into the first round of implementations. Excellent article which draws historical lines and explains some of the non-linearity in spec development. Elika’s comment is also very good. It’s a pity that CSS doesn’t have selectable regions; the proposal which is mentioned in the article had numerous problems which were identified early, but not rectified. CSS multi-column layout provides a model where regions are created and placed automatically. By adding column selectors, one could quite easily provide selectable regions.